Tender Loving Empire’s 11th annual Friends and Friends of Friends compilation is being released soon. TLE has described it as “by far the best grouping of music that we’ve ever been able to put in one place at one time.” But that’s not all the record label is giving us. TLE and White Owl Social Club are teaming up to throw All Together Festival. The festival, which takes place next Saturday, August 18th, is a celebration of the compilation release. 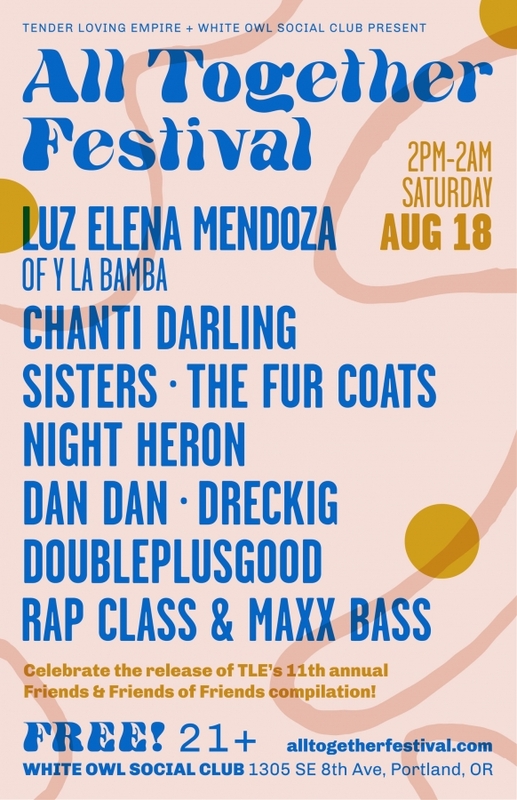 It will feature live sets from local acts such as Luz Elena Mendoza of Y La Bamba, Chanti Darling, and The Fur Coats. The bands will be playing starting at 2 in the afternoon, and starting at 10 DJ’s Rap Class and Max Bass will be taking over. The show is 21+, and free. You can find the event page and full lineup here, and pre-order the Friends and Friends of Friends compilation here.